35 people were found dead and approximately 200 were badly injured in Galicia in northwestern Spain this morning after a terrifying train crash. There were bodies lying on the railway. 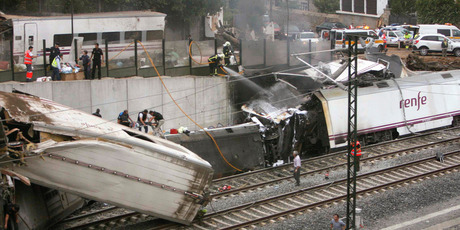 An accident also occurred in a city near Santiago de compostela says the renfe railway company. Carrying 238 passengers, the train originated in Madrid and was bound for the northwestern town of Ferrol as the Galicia region was preparing celebrations in honour of its patron saint James. It derailed near Santiago de Compostela and no one knows why. Here is the link to the site I had found it from. This is very sad indeed Hosannah. It is the second major train crash in Europe this month - Do you know where the other one was? Paris Live on News - The Girl With Gold Locks! !